Je voudrais présenter Mademoiselle Ella Coquine. I came to Paris three years ago with somewhat of a stable knowledge of beginner’s French. Preparing for this big move took almost six months of crash coursing the basics as I inundated myself with French culture. To absorb the language, I went full immersion and would only listen to French music, watch French films and even force my French co-workers to invite me out with them in an attempt to chime in on their conversations. Looking back, I'm almost positive that sounded like an idiot. Who could possibly be conversational in another language after six weeks? Upon my arrival in France, I did find that my preparation paid off, as knowledge of the basics presented solutions for every day problem solving. Should I come face-to-face with a wine crisis, meaning that there was none, and the market was closed. Pas de problème! I could efficiently ask someone where the closest market was. Or how about if my stretched out ballet flat slips off my feet, falls through the wooden stairs of Pont Solferino leaving me no choice but to watch it float down the Seine like it did yesterday? Pas de souci! I could hobble into a nearby restaurant and politely ask them to call me cab, as I balance on one foot. Still wanting to excel in my French, and to not just assume that I would figure it out once I was here, I decided to continue my studies in Paris and my determination to become a fluent speaker. Attending a new class would be a fresh start, and I had high hopes that I wouldn't have the same problems that I had in New York. In New York, our teacher was distractingly good-looking, making concentrating on our lessons increasingly difficult with each passing class. Whenever he would call on me, I reverted to my inner-fourth grader and would turn a deep shade of red, nervously drop my pen and refuse to respond, ignoring the fact that it’s generally a requirement to speak in a language class. It was uncomfortable for him, me, and not to mention the rest of the class who knew that I was majorly chaud for teacher. Expectation # 1 in Paris: Hope that new French teacher will be a wretched old shrew. A week before class, I took an online placement exam, was pleased with the level I was put in, and arrived wide eyed and bushy-tailed for my first French class in Paris! Bonjour la France! Unlike my New York class where there was a maximum of nine students, my class in Paris had over thirty, taking away the intimate learning atmosphere I had grown accustomed to. The teacher on the other hand, exceeded all expectations regarding my request. Madame Cours was certainly wretched, in her late sixties, and wore a purple mohair sweater where somehow the fuzz from it managed to find itself on her two front teeth. She was skinny, pursed-lipped and cold. Her icy demeanor gave me the sneaking suspicion that she couldn’t care less about the joys of teaching her language to hopeful foreigners. She skipped first day introductions, ignored the fact that we had actual names, and slammed a cassette player from 1976 on to the desk for us to listen to awkward dialogue while she read the latest copy of the French tabloid Oops!. After the recording, she asked the class what had happened in the dialogue between the hotel clerk and Madame Martin. The students all competitively spoke over one another, desperate to answer her inane questions, and getting flustered that their attempts to gain her approval were blatantly ignored. I found their enthusiasm completely useless. Didn’t they pick up on the fact that she didn’t care about our progress, and was far more concerned with the reunion episode of Secret Story? How was I the only one privy to her indifference? Week three of class was just as painful as the week one; no one spoke, only the click from Spain in the corner, and even though we were familiar with each other’s faces, our regard for one another ended there. On a sunny autumn day in Paris, Madame Cours began the lesson with a topic on stereotypes, “Les Stéréotypes” to accurately paint the picture. To get the ball rolling, Madame volunteered some typical stereotypes of the French and allowed us to participate with some of our own observations. There was a mention of berets, baguettes, snails, and smoking. In my opinion, a few of the key cliches were left out, but since it’s a classroom, there is a responsibility of the teacher to keep it a politically correct platform and to not offend other cultures. Fair enough. We moved on to Spain and breezily mentioned guitar players, siestas and bull fighting. We all nodded in agreement. Suddenly one of the guys who we all thought was part of the crew from Spain reveled that he was actually from Columbia. Talk about throwing us a curve ball. The class being a bit stumped finding a friendly stereotype, offered that when we think of Columbia, we think of the heat. That’s it, according to to our class, the only stereotype associated with Columbia is that it’s just really hot there. Moving on. Australia had its surfers, and Russia had beautiful women and vodka. Everyone expressed respectful and complimentary stereotypes of everyone’s home land. And then my turn was up, The United States. Suddenly the whole room was staring at me in disgust, and the only things that came to the minds of my classmates in regard to my country was obesity, tax evasion, greed, filth, hormone-fed products and George Bush. Not even wanting to indulge in being offended, my brain could only focus on one question. Where was all of this vocabulary suddenly coming from? These were the same people who twenty minutes ago couldn't speak in the past tense but were now somehow able to say tax evasion and free-range poultry in French? Did I skip a class? If I knew it was this kind of game, my last hour wouldn’t have been so painful listening to obsolete cliches, and would have certainly mentioned Pablo Escobar, the famous coke lord from Median when Silva confessed that he was from Columbia! I would have loved to been able to say that in French! The neglect for my needs was mounting. Being more confused than irritated, I tried to negotiate the direction this lesson was going with Madame Cours, and requested if we could narrow it down to New York where perhaps the stereotypes would be less general. Madame Cours looked at me and gave me a curt “Non.” Clearly she was getting evil pleasure out of this and hates America. Clearly. The topic of stereotypes was immediately dismissed, never to be mentioned again, and Madame had us revisit our plus-que-parfait which she called horrendous and accused us of not absorbing a thing in the three weeks she had been teaching us. I never continued onto week four of class and just found a French boyfriend who made the learning process much more enjoyable. While my plus-que-parfait is far from parfait and my subjonctif could use a fine tune-up, leaving that class was best thing for my sanity as well as my bank account. I do sometimes wonder whatever happened to my fellow classmates. Did they stay in class? Are they still in Paris? How's their French? As I approach my three year anniversary in France, I look back on these moments that were once the bane of my existence, to now, funny anecdotes of a time I am now nostalgic for. I long for the days of being naive, and curious, but remain enchanted and grateful to be living in Paris; a city I now call home. Merci Ella for entertaining my readers while I'm sitting on the port of Cassis, sipping crisp, white, local wine and stuffing myself with fresh seafood. It's a hard life but somebody has to live it. P.S. Today is the last day to enter my Folly of French Kissing Giveaway. Click here to enter. Bonne Chance! Thank you Sara for our blogsitters!! Nice to meet you Ella! I enjoyed being taken into this French class - as a French teacher for foreigners, I despise les Madame Cours!- and I'm glad you run away! And I think I'm going to run to ta chambre de bonne to find out what happened after that! Nice to meet you too! Thank you for commenting! Yes, Mme. Cours couldn't be bothered with us. You seem like you're probably a much nice French teacher! I wish I took your class instead of hers. Hi Vanisha! Thank you so much for this lovely comment and the ones that you have left on my blog! Hee hee, a definite new blog to follow! j'ai suivi le course de francais. Podclasses are great too. To polish my vocabulary I listen to them, and also subscribing to TV5 Monde helps you stay in the French loop! I had a few months in America where I felt like I was losing it and these resources help. This is hilarious! Mme Cours herself is a stereotype and she sounds like the original old bag. But you have survived to live another day! Vive Cassis, le vin blanc et le seafood!! What a douchey French class! The stereotype thing would piss me the _ off.. So rude! I admit, I have yet to take a French class. I've heard a lot of negatives about it as well; guess it takes time to find a good one. Funny about the hot teacher.. ha. Adorable pic Ella :) ..and happy 3 year anniversary à Paris ! Sara: I love Cassis, enjoy. "La Poissonerie" is a nice restaurant; was recommended to my bf from his French colleagues who live in the area and was indeed yummy. If you get a change to visit the calanques go for it, especially the calanque de Sormiou in Marseille. Thanks D for commenting over here! So nice of you! I know this post was a bit long, but you know me. I'm a chatterbox on line! Yeah, the stereotypes thing was really annoying. I was openly miffed. Great post, Mlle Ella!!! I sure don't miss the good old days when George Bush was president and most Europeans seemed to hold me personally responsible. I love that you cleverly tried to limit the damage by saying that you're from New York! Thanks for inviting us to join you in Le Petit Village today. It was wonderful to have a virtual break from Paris! Sara, Sipping wine and sitting at a cafe in the port of Cassis sounds like the perfect way to enjoy a sunny day. I still have fond memories of being there in September and October a long (really long!) time ago. Enjoy! Thanks for taking the time to read my uber-long story! Yes, I'm glad those Bush days are over too! What was infuriating about the class was that it was 2009 and Obama was already in election! We should have talked about him! Bush is so mid-YK! soo glad you are living that life sara, so we can all read about (and drool over) it!!! 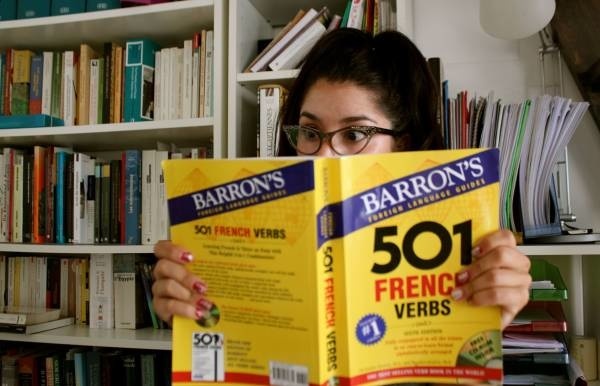 love your rundown of french 101 classes. i agree - the best immersion is the boyfriend method - you shot straight to the top of the class hehe!!! Yes, the boyfriend method was proven to be quite effective! Thanks for your comment. I'm glad you enjoyed the post! Madame Cours reminds me of Cameron Diaz in Bad Teacher! Oh well, learning from a French boyfriend is loads better than any language class I'm sure. I think this wraps up the comments for this post. I want to thank Sara for inviting me to guest post and for introducing me to your lurvly readers! Thank you again!!! Looking forward to your next guest blogger!! xo!